Viktor, my six year old son, and I filled and folded 35 spinach wonton raviolis. He's quite the meticulous one; thus, the model perfect raviolis. It was a cold and gray afternoon, and we were cozy at home busy adding more raviolis to our lot and looking forward to dinner. 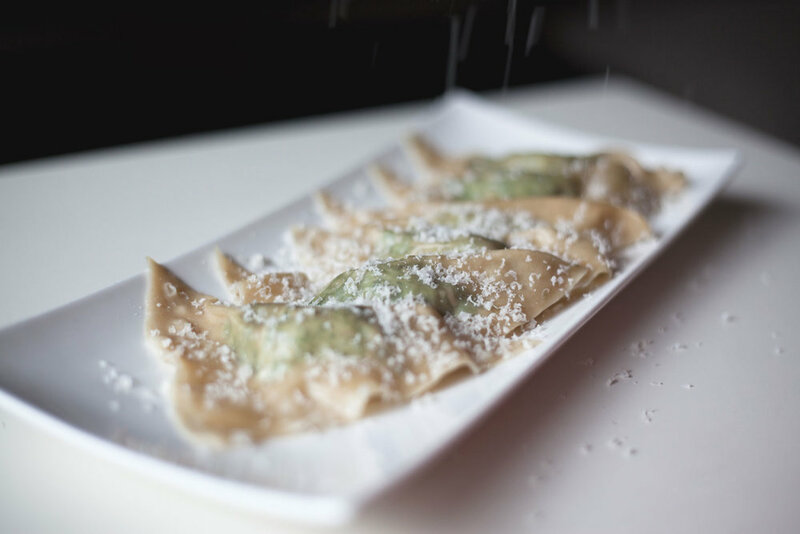 It snowed while Viktor and I were setting up to photograph these wonton raviolis. We were so engrossed with how to steady the reflector while he would be assisting in the "snowfall scene" of the Parmigiano Reggiano that we didn't even notice the real snowfall scene happening right outside. It was already late in the afternoon and we were racing against the light of day. He was busy grating away at the cheese and I was looking through the view finder trying to capture the moment. Through the view finder all I could see were these white, fluffy flakes of cheese falling upon the wonton raviolis and thinking to myself, this looks like a beautiful snow flurry scene and how nice it would be if it happened just once before spring comes upon us. Interrupted by a phone call from "Papa" asking if it was snowing by us because we get all kinds of different weather in different parts of this city at the same time—lo and behold, large, fluffy snowflakes tumbling down right under our nose, and not the Parmigiano Reggiano ones, but the real ones! We dropped everything, and ran to get our boots, coats, mittens, bonnets and scraves—the whole bundle—so that we could play under the snowfall. Take a large pot and fill it with roughly 3 inches of water. Bring the water to a boil. Add your fresh spinach and some salt and close the cover to steam your spinach. It should take about 5 minutes. Once it is a saturated, dark and wilty green, take it off the stove and let it cool on the side. Place your egg yellow, ricotta cheese, Parmigiano Reggiano, nutmeg, salt and pepper in a medium size mixing bowl. Mix by hand. Take your cooled down spinach and squeeze out as much excess water possible. Place it on a cutting board and chop finely. Add the spinach to the mixing bowl with the rest of the ingredients and mix it together. You can also transfer the spinach to a food processor and process with the rest of the ingredients until smooth if you don't want to mix by hand. Lay out your wonton wrapper and place 1/2 tablespoon of the spinach filling in the center of the wrapper. Brush some egg white along the edges of the wonton wrapper and take one corner of the wrapper and fold over to meet the other corner. Gently press down from the center towards the edges to press out any air and to seal the wonton ravioli. Dust a baking sheet with some flour and line up your raviolis. Bring a large pot of salted water to boil. Add some raviolis making sure not to overcrowd them in the pot. Boil for 3 minutes and take them out with a slotted spoon and transfer them to a plate. Grate some Parmigiano Reggiano and drizzle some olive oil over the spinach wonton raviolis and serve immediately. The wonton skins are delicate and they cook quickly. They will burst if you let them cook too long. My mother in law gave me a great tip...I freeze a whole untreated lemon so that I have it on hand for use. I grate a bit of this frozen lemon over my raviolis along with the grated cheese and olive oil for a fresh twist.